98 / the tasting panel / november 2018 THE VISIONARY JEAN-CHARLES BOISSET provides a sense of escapism through his wines and fanciful label designs, and after the Tasting Panel team tasted through many of his selections in recent months, we wanted to dedicate an expanded edition of Publisher's Picks to the more outstanding examples of his handiwork. 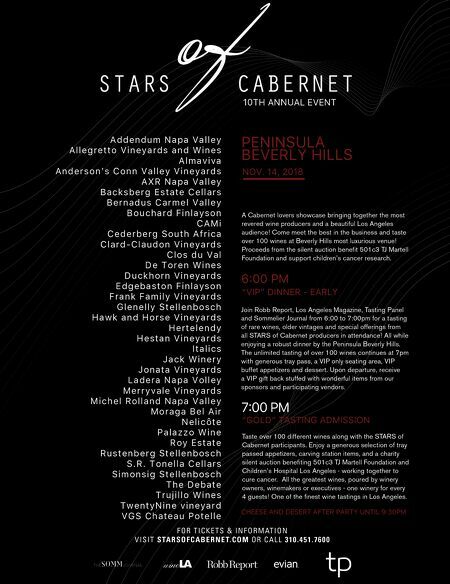 Buena Vista Winery 2016 The Sheriff of Buena Vista, Sonoma County ($40) At 15.5% ABV, this structured blend of 34% Petite Sirah, 33% Cab Sauvignon, 14% Grenache, 11% Syrah, 5% Petit Verdot, 2% Mission, and 1% Cab Franc wears its badge proudly on a stately bottle. Named for Agoston Haraszthy, the founder of Buena Vista and one of California's first sheriffs, this bold red surges forth with berry-tinged mocha, anise, blue-floral tones, and mineral-kissed coffee. Guns drawn, it finishes seamlessly with fine acidity. 95 BOISSET COLLECTION Buena Vista Winery La Victoire Brut Champagne, France ($50) Made in the méthode traditionnelle, this wine blends Pinot Noir (70%) from Premier Cru vineyards in the Montagne de Reims with Chardonnay (30%) primarily from Grand Cru Le Mesnil-sur-Oger and Chouilly. It was aged more than three years—way over the minimum for a non-vintage Champagne. The bubbles generate goosebumps on the tongue as orange peel, tarragon, peaches, caramel, and cinnamon join together for an exciting ending. 96 BOISSET COLLECTION LVE 2015 Red, Napa Valley ($50) This Legend Vineyard Exclusive release (created with musician John Legend) combines 65% Petite Sirah and 35% Merlot. Sumptuous slate and dark- berry scents precede aromas and flavors of violets that linger throughout. Espresso- bean tannins coat the teeth as blueberry, boysenberry, and black tea emerge on the expressive finish. 95 BOISSET COLLECTION Le Duc Noir 2016 Pinot Noir, Sonoma Coast, Sonoma County ($30) Tobacco, earth, and chocolate cherry are indulgent ambas- sadors of this aristocratic red. Deep notes of espresso bean, anise, and graphite compli- ment blackberry, black tea, and black cherry. This is barrel-aged sur lie for seven months in 100% French oak. 94 BOISSET COLLECTION Digression 2017 Côtes de Provence Rosé, France ($30) The uniquely shaped bottle speaks to this inimitable cool-climate rosé's goal to "stand out and shine brighter than the rest." Pink grapefruit, raspberry, and floral tea mesmerize on the nose as hints of orange rind and salted cranberry keep things lean and tart. A thread of minerality completes the finish. 70% Grenache, 15% Cinsault, and 15% Syrah. 92 BOISSET COLLECTION Lyeth Estate 2016 Red, Sonoma County ($20) We believed this was a $50 wine at first taste. Red fruit is fresh and lively on the nose with touches of cedar and sweet tobacco. The acid threads between the density, working through plum, violet, and baking spices as the luxuriously round tannins glide with depth and soul. This blend of 43% Merlot, 26% Petit Verdot, 18% Malbec, 10% Cabernet Sauvignon, and 3% Cab Franc is aged in French, Hungarian, and American oak. 95 BOISSET COLLECTION Evoluna 2015 Chardonnay, Sonoma Coast, Sonoma County ($30) An edgy nose of lemon oil and buttered pears precedes the tongue-coating presence of pineapple and kiwi. It's rich yet tempered with tightrope acidity and a refreshing finish of melon and pear. 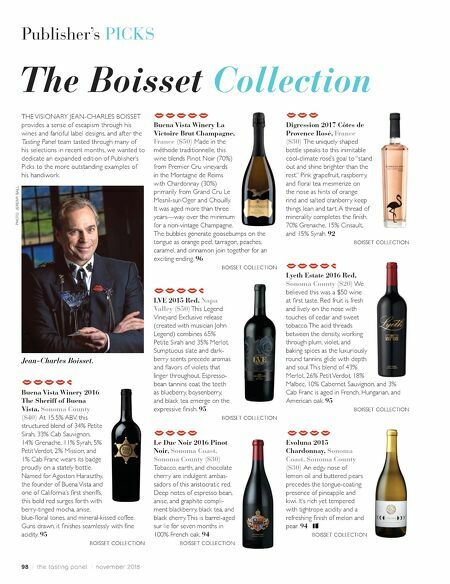 94 BOISSET COLLECTION Publisher's PICKS The Boisset Collection PHOTO: JEREMY BALL Jean-Charles Boisset.